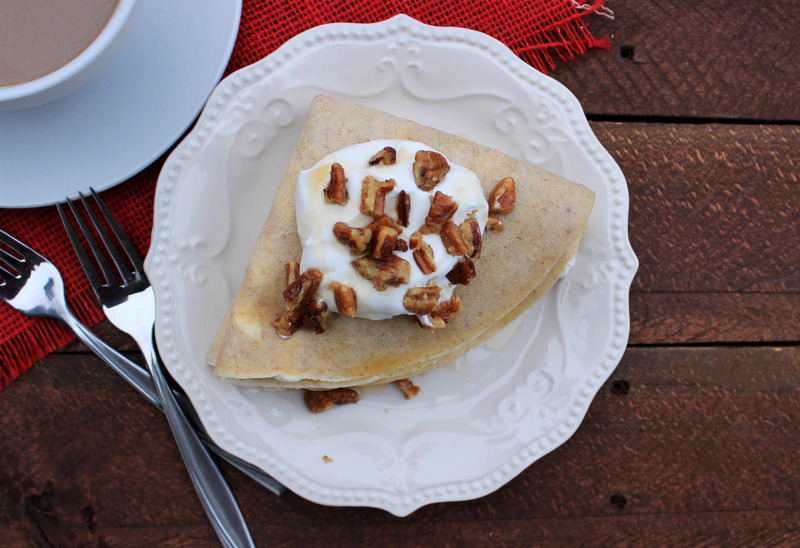 These Gingerbread Crepes are the perfect ending to your weekend brunch! 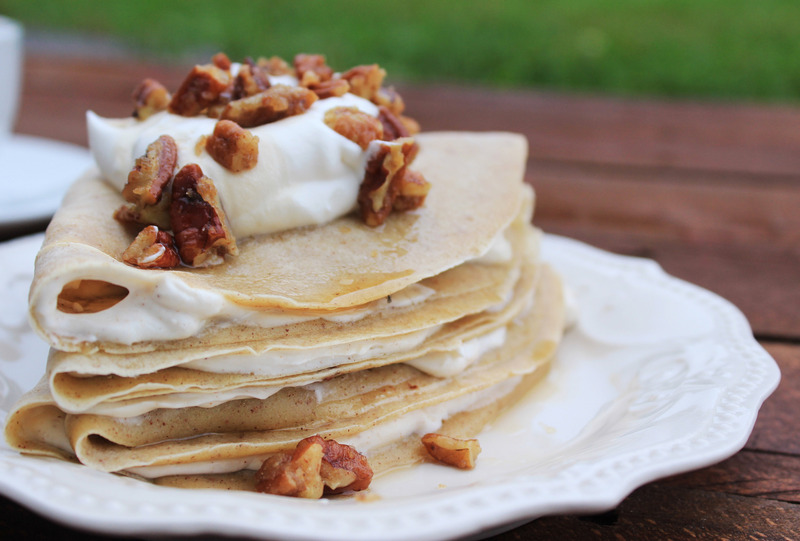 The candied pecans take them over the top. Its that time of the year for crisp mornings with all things pumpkin, gingerbread, and warm lattes. The inspiration for this recipe came as I was driving to my in-laws the other day thinking about food. Please tell me I’m not the only one who thinks about food at all random hours of the day and night!? Stan, who’s not normally a huge fan of sweet crepes loved these! And that is huge. If you like spices and nuts, you’ve got to give these a try! They’re super easy and fast to whip together. Perfect for breakfast or if you’re offbeat like me, they make a great dessert to a weeknight dinner! What are your favorite fall recipes? I’d love to hear from you! In small skillet over medium heat, melt butter. Add pecans and toast for 5 minutes, stirring frequently. Add brown sugar, stirring to coat pecans. Sprinkle with cinnamon. Remove from heat and cool. In medium size mixing bowl combine, flour, spices, sugar and salt. In separate dish whisk eggs, milk and melted butter. Whisk milk mixture into flour mixture until smooth, being careful not to over mix. Preheat non-stick skillet over medium heat. (I buttered mine the first time but I don’t think I would have needed to) pour crepe batter into pan, spreading it evenly over pan in a thin layer. Cook 1 minute on each side. Remove from skillet and repeat until the batter is finished. In medium size bowl, whip cream cheese, maple syrup and cinnamon until smooth. Add whipped cream and fold in with spatula. 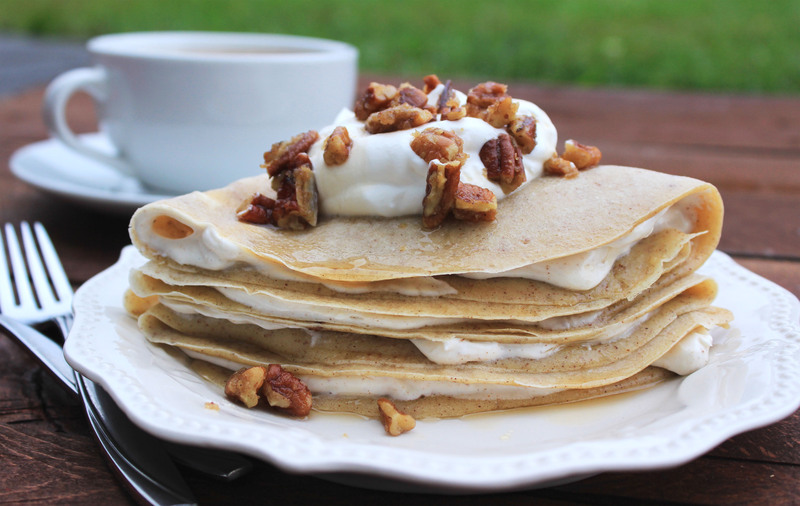 Assemble crepes: on flat crepe, spread a thin layer of cinnamon cream cheese mixture, fold in half and then in half again. Place on plate. Top with a spoonful of whipped cream. Sprinkle with nutmeg and a generous amount of candied pecans. Drizzle with maple syrup. Serve immediately. I love all those layers! Yet another recipe I’m going to try! I love the way you think. How about a gingerbread coffee cake? This looks fabulous!! I’m crazy about fall desserts right now. A favorite fall dessert of mine is caramel apple cheesecake bars..
Oh my, I might need to go bake myself a batch right now! Those sound WAY too good!! !